Our family is so proud of our brother/son/uncle/cousin for working so hard to teach a class this semester. With his visual impairment, we know it is so difficult and frustrating to do what was once routine that is now so time-consuming! We are also very proud of Keith who is doing so well and working so hard at University of Alabama-Huntsville as he pursues his degree in engineering. We were so elated to hear that the JPII High School Cross Country teams in Madison, Alabama(both boys and girls)were Runner-Ups in the State Meet and Stephen was All-State with his 15th place finish and a PR. YEAH!!! But as most of us acknowledge, behind every successful man is a wise woman and her name is Ginny! We salute ALL of you for your faith, your perseverance in the face of enormous obstacles, and your loving presence to your family and your community. Charge on! Happy Memorial Day everyone. Our thoughts and prayers go out to all those who have given their lives for our country and those military who are stationed overseas and missing their families. We also pray for all the victims of the tornados in Alabama and Joplin, Missouri—certainly a continued wake-up call to never take our loved ones for granted. 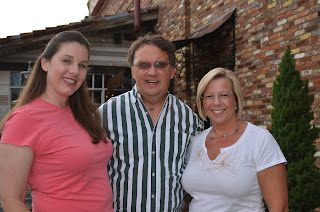 As per my brother’s request, I have attached a photo to this post of Joe along with two former UAH students: Willa Cummings (on left) and Meredith Johnston (on right). Joe recently took them out for dinner at Rosie’s. Willa has an interview with a progressive surgical unit at Huntsville Hospital, and Meredith has a job at the Huntsville Hospital ER. Joe commented, “Based on my experiences with them, I’m sure they will be skilled and compassionate nurses.” Our entire family continues to be very grateful to all the medical professionals that have helped and continue to aid in Joe’s recovery, but we have a special place in our hearts for the skilled and compassionate day-to-day care of all the wonderful nurses at Huntsville Hospital and related medical centers! The forehead prostetic surgery in Birmingham went great. As you can see from the picture, the dent is no more. So the "new and improved Joe", as one friend commented, is right on target. I could not agree more. So many folks have been amazed at the success, prompting Joe to call his Surgeon, Dr. Fisher, the Master Craftsmen on our follow-up visit. Infection concerns are behind us now too. The incision is barely visible and back in the hair line. This same surgeon called Joe the Master Healer, and welcomed him back anytime from that standpoint! Pretty funny. Just last week Joe was released to exercise and resume all activities. An amazing thing that we just realized is Joe has no impending surgeries on the horizon. What a great feeling. Additional work on his right eye will be basically cosmetic so for now Joe has opted just to take a wait and see approach for this issue. So the horizon is back to normal. We are looking forward to some family travel this summer, college visits with Stephen and basically doing what most folks due in the summer. Wow. 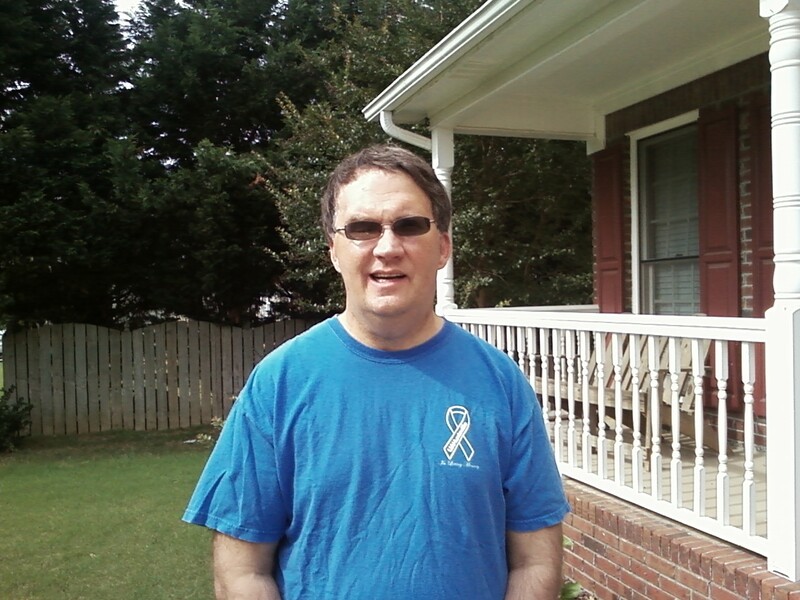 In the Fall, Joe will teach one class at UAH, with a classroom assistant. If that goes well, he hopes to pick up a second course for Spring. One step at a time. I remind him there is no rush and the University could not be more supportive of his gradual return. I have always thought of us as a pretty boring couple and we are pretty much there. What a blessing! Thank for your prayers for this latest surgery. It could not have gone smoother. Wishing everyone a peaceful summer. Just a quick note to let you know that Joe is now at home recovering--he was released from the hospital yesterday. He is doing well. We wanted to let you know that Joe's surgery yesterday went great! The surgeon told everyone that the plate was a perfect fit. Joe ate a great supper last night and was ready to walk (though the nurses politely told him no, he wasn't ready yet). Joe eating and doing well again today. He had a CAT scan at 4 am this morning, but no one has peered under the bandages. Today he was moved to a regular room and may go home as early as tomorrow night. We are glad that Mom and Dad Leahy are there to help out! We appreciate all your continuing prayers and please pray especially that he doesn't get MRSA again as this is a repeat surgery of what he had in October! Love to all and to all our Christian friends, have a wonderful Easter! 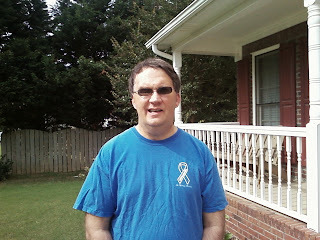 With the blessing of several docs, Joe will have Neurosurgery next Monday, April 18, at UAB Hospital. This surgery is a repeat of the plate surgery from last September, except hopefully the infection part will be avoided!! The defect, as they call it, on his forehead will be repaired by inserting a plate. Joe is not concerned at all, this being his eighth surgery, feels like no big deal to him. Being somewhat of a worrier, do feel the normal concern but with the support of Phil and Jackie, Joe's parents, this too will be behind us....again. As the Docs have signed off, Joe has been determined to be free of any lingering infection, MRSA or otherwise. So that alone is a great relief to both of us. And I must say Joe is the picture of health. Though still some weakness on his left side, much of his strength has returned. Fatigue is still a huge issue but with time I know that will improve too. Lots of naps are necessary but concentration seems to be improving all of the time. The vision is very limited which creates much of the fatigue. That is our next step....finding solutions to this vision strain. We have some leads out of state that I hope to pursue after Joe has recovered from this surgery. The scleral shell has only been of very limited success. Our ophthalmologist thinks some surgery will ultimately be necessary on the right eye and that orbit (socket). But this will be well after the recovery from the plate and the doc feels this is no rush. So we march on, anticipating surgery soon. Holy week and the joy of Easter will be celebrated with the boys and Joe's folks. That will be wonderful. We wish you the same peace and joy. It has been an exciting week. On Monday, Joe got his scleral shell prosthesis installed in his right eye. It adds volume under his lid, giving a slightly more natural look. It will be enlarged over time, with the goal to relieve irritation and drainage and for aesthetic purposes. His right lid opens slightly, occasionally. It seems unlikely that the blinking function will return but we will see. When asked, Joe says it is not too bothersome and says he is not willing to spend energy thinking about it. So that is good. We went to the gym yesterday. For jogging, he is wearing gauze patches underneath his eye patch to insure the shell does not fall out. This shell is bigger than the last one but would still fall out if the lid happened to open. Last Wednesday Joe gave a practice lecture to two of his therapists; General Microbiology 1. The lecture is from the class he hopes to teach in the fall. It includes a PowerPoint presentation, chalk talk, along with the lecture. It got great reviews with one of the therapist indicating that she would have liked biology more if he had been her instructor! This was so reassuring to me and an answer to my prayers. Then on Thursday we met with the therapists, disability/workers comp staff, and state rehab, trying to coordinate back to work needs. So much support has been offered. We are so blessed. New computer monitors, voice response software, and home therapy software are being ordered, along with some magnifying equipment for Joe's office and lab. And finally, Joe is taking an on-line course in coaching so that he can support our Head Coaches for high school track and field. This has taken about 8 hours, and he is half way through. It is a lot of reading, short quizzes and tests. I am pleased to see him doing this task proficiently. It certainly has taken him significantly longer than it would otherwise due to his vision, but he has staying power and the willingness to do it even though it is a struggle and exhausting. Eye (left) fatigues is a huge problem. We have some leads for this common issue, which will be on the agenda for after the next surgery....and tax season. Spring has sprung in the South. The tulips are incredible. I sudddently ran into a problem logging into the blog which Derek fixed for me. This blog was suppose to be posted before St. Patrick's Day so lot has transpired since then. Here is the entry from Ginny from March 16. There will be more updates soon. I feel badly that I have been so delinquent in providing information. It was sort of easier when Joe was regaining abilities by leaps and bounds. But as I mentioned on the phone, this last 20% of recovery is going to be rough. Frustrations with limitations and awareness of same makes for some hard times. But both Joe and I see continue progress with the help of so many professionals and certainly by the Grace of God. So here is the post. Adjust as you see fit. We are happy to share this photo of our family that Phil took at Christmas. You can see Joe's forehead defect and his right eye lid does not open nor does this eye have the capacity for vision. Procedures to determine the best course of action for Joe's right eye are in the works currently. Right now the plan is to reinsert the plate in Joe's forehead in mid-April and we are pretty excited about giving it another try. Joe has set a goal to teach one class in the Fall. Lofty, to say the least but he certainly has the will to do it. The University could not be more helpful in helping achieve this goal. I am excited to see some of Joe's executive functions returning. We knew this would be the rough part as the right frontal lobe was so greatly injured. Layer this with very limited vision and boy, is it tough. 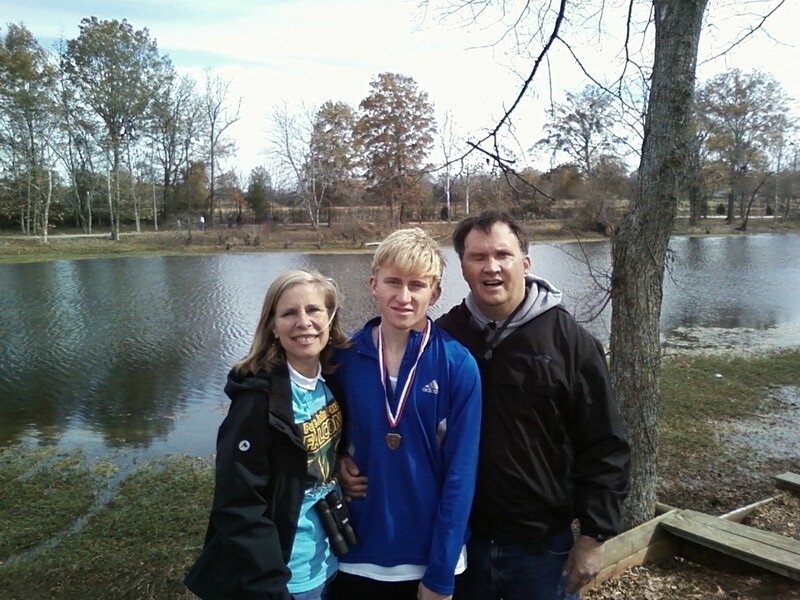 But I see evidence of improvement in keeping track of things, organization, calendar management and he has even begun developing logical schedules for Stephen in track practice. I am excited to see continued improvement using a computer, especially programs like excel and other critical applications. I regularily see him doing track spreadsheets, inserting rows and columns with a format that changes from week to week. That is really cool. We work together to do some timing at the meets for our athletes, just for practice. It has been so fastinating to witness the healing process of the brain and body. I am humbled to see the work of God's Hand. While frustration is now a regular feeling, we are constantly reminded by well wishers of just how far we have come. We are so blessed to enjoy continued recovery and even more so, blessed to have by great families and friends keeping us in their continued prayers. So the Leahy's say, Happy St. Patricks Day. Today at 2:00, UAH is having a Remembrance and Renewal service in recognition of the one year anniversary of the shooting. Joe and I will attend. As I understand the program, speakers will talk about the deceased faculty with the idea that their shared mission to educate is being carried forward. There is so much emotion surrounding this event as we mourn our deceased colleagues yet persevere in hope in the resilience of the many good people who survived this tragedy. Though we must take time to remember, I will be glad when today is over as I find myself reliving some of that horrible day. It is somewhat of a blessing that I can't recall much of the first days; I suppose some state of shock has blocked certain memories and images. I suppose the strange part is that this whole thing has brought us closer, maybe out of necessity or maybe it is part of our plan. It has surely brought us closer to our faith and definitely helped me to see that we are not in control and each day is an opportunity to live well or not. Some of the hardest parts for us are ahead but I still see great recovery and even where we are right now would be fine. Joe has set goals that he is working toward and he will get there. I so am thankful for today. Thankful that we can go to the ceremony together, Joe being much his normal self. as so many of the medical supplies and devises. to manage the current and previous infections. that he is fun and agreeable in managing life in a different manner. Thankful for great sons who smile and help me be strong. who keep the prayers coming and that I know will help on a moment’s notice. so the day to day operations of living have not been strained. Thankful for my continued good health and the good health of our children.